We’ve been traveling a lot recently, with trips to Colonia, Uruguay; Tigre, Argentina; and Córdoba, Argentina. The past few days I’ve been getting back into the custom of class and studying the subjunctive form. I walk around the city thinking of sentences of desire or possibilities in which to use it. My language ability changes day to day. I feel best when I’m in the city and immersed in conversations, whether comfortable or not. 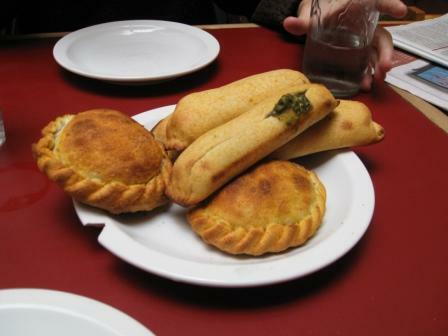 Empanadas may be my favorite food in Argentina. The savory, buttery insides and crispy, hearty dough make them comfort food. I look for spicy choices on the cartas when we go out to eat. While an item on a menu may say “picante,” it’s usually mildly spiced at best. When I discovered on Saltshaker that I could find a spicy cabbage empanada in Belgrano, I had to make the trip to La Paceña.